The aesthetics of the Broadway musical advertise emotion rather than express it. Shows on an open-ended run rely on the viewing habits of visitors stopping into the city for a weekend; hence the preference for brand-based productions and the inevitable impersonality of shows bloated by the weight of the franchise behind them. So it’s depressingly perfect that Tim Burton has now, with the Stephen Sondheim adaptation Sweeney Todd: The Demon Barber of Fleet Street, found himself on the Great White Way. Burton, an above-the-title property for the better part of two decades now, has slowly production-designed his way from sensibility to brand, his notes of goth whimsy digitally amplified past any point of individual distinction. The obsession with elaborate craftsmanship that characterizes his object-fetishizing opening credit montages has spilled over into the rest of his films — the glossy assembly-line sequence introducing 2005’s sugary Charlie and the Chocolate Factory seeming particularly telling in this context. His most shoddily appointed film remains his best: Ed Wood, an ode to a DIY oddball constructed with sympathetic flimsiness, leaving plenty of room for creative mileage-squeezing from the cardboard mise-en-scène, and flourishes of personality from Johnny Depp and the rest of Burton’s loveable losers. 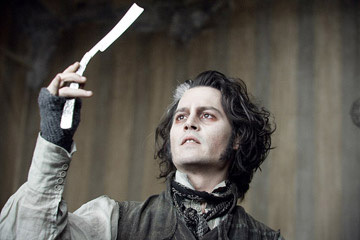 It’s a mystery, though, how anybody is supposed to act around Sweeney Todd without being choked by it. A penny dreadful made for millions, the film recreates the squalor of Victorian London to lavish affect. Adapted from lurid urban legends gradually enlarged to accommodate cannibalism and themes of vengeance, the story of the titular throat-slashing tonsorialist is steeped in grime, gristle and gore — but as Todd, Johnny Depp needs but flick his wrist, like Edward Scissorhands whirring into a hedge, and his razor draws a Starburst-hued gusher. (The blood is liquid latex; despite the volume spilled, it has nothing on the viscerality of the year’s other notable too-close shave — the opening scene of Eastern Promises.) To give the narrative an operatic sweep, Burton and DP Dariusz Wolski crane across skylines buffed to a CGI sheen; smokestacks — crowning factories where, one assumes, the working class blackens its fingernails before dying early and docile — belch inky, voluptuous clouds. When a beetle skitters across the counter of a pie shop, its shell catches the light, and glistens. Critics seem to have settled on “Grand Guignol” as operating principle here, but Sweeney Todd is maybe a bit too Grand for its own good. It’s all danse, no macabre. Burton, according to sources, nearly tripled the number of musicians required for Sondheim’s score. Which is, bluntly, a mistake. Sondheim’s lyrics are punny and allusive, almost proselike in their denseness and literary in their meter. More than many of his contemporaries — and certainly more than any of full-cast-album merchants currently peddling their wares on Broadway — his songs work in productions scaled down even to the level of readings and recitals. His songs, though complex to navigate, are kinder than most to nonprofessional singers, and the members of Burton’s company hold their ground via the steadfastness of their respective personae. As Mrs. Lovett, the accomplice who bakes Todd’s victims into meat pies, Helena Bonham Carter is all Betty Boop complexion, rat’s nest hair and proto-Suicide Girl pliability; as Judge Turpin, so villainous he employs a mustache-twirling underling so he doesn’t have to grow one himself, Alan Rickman swallows another bolt of velvet. The bottom half of the marquee seems to have been recruited for their ability to play to the mezzanine, and fares less well: For Jamie Campbell Bower and Jayne Wisener, hitting the high notes in the romantic subplot, Burton might as well have inserted footage of any of the pointlessly soloing lovebirds from a Marx Brothers comedy. Then as now, the idea of the love story, more than its specific content, was supposedly the draw — something for everyone, as the slogan goes. Sweeney Todd is a jingle, all the way.